Posted on June 25, 2012, in Blue Monday, Mellow Yellow Monday, Mexico, Michoacán, Morelia, REDnesday, Ruby Tuesday 2, senryu, Shadow Shot Sunday 2, Straight Out of the Camera Sunday. Bookmark the permalink. 17 Comments. Beautiful Pic! i love flowers! Oooo, a lovely selection of flowers from which to choose! I remember walking through an Asian shopping mall this past December. Loved all the colors and smells and sound. Mercados are like that too. They are such vivid contrasts to our typical malls and lots of fun. My kind of madness! 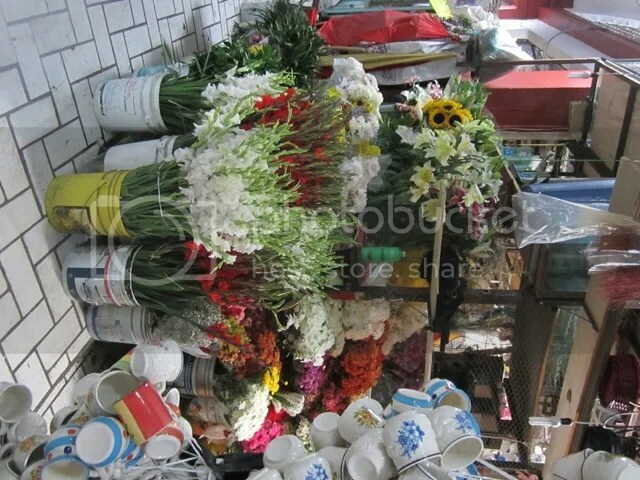 I was just in a Mexican mercado to purchase Jamaica blooms for tea, the best for these hot hot days! Oh this is just beautiful! So much color and bright crockery. I love marketplaces and the hustle and bustle,the good smells and the people passing by. Lovely photo and haiku . Lovely collection of flowers but my eyes are drawn to the ceramic pots on the right, they are beautiful. I ditto what Moelle said. But, I have to ask — with all the stuff in the news these days have you ever been afraid of going to Mexico? I’ve never been to Mexico, but I think that when people are selling explosions of flower beauty on the corner shop, there cannot be that much to fear. A mad riot of colour, so dramatic! Stunning street display! Beautiful flowers in different colors.. I love these places….where I can buy the unique and haggle with the proprietor. Fun all the way around. Great photo.